The U.S. Center for Disease Control issued a statement today that Blue Bell Creameries' products may have been the source of multi-state Listeria monocytogenes illnesses that occurred over the last five years. The CDC was able to trace the Listeria strain back to Blue Bell after Listeria samples taken from across the United States since 2010 were genetically matched. "This is a complex and ongoing multistate outbreak investigation of listeriosis illnesses occurring over several years," the CDC stated. "Several strains of Listeria monocytogenes are involved in this outbreak. Information indicates that various Blue Bell brand products are the source of this outbreak." The CDC was able to identify patients with illness onsets ranging from 2010-2014 through a retrospective review of the PulseNet database for DNA fingerprints that were similar to isolates collected from Blue Bell ice cream samples. Since the last CDC update on April 8, 2015, two additional patients, one each from Arizona and Oklahoma, were confirmed to be a part of the outbreak by whole genome sequencing. As of Tuesday, the CDC has recorded a total of ten people infected with several strains of Listeria monocytogenes from four states: Arizona (1), Kansas (5), Oklahoma (1), and Texas (3). The illness onset dates ranged from January 2010 through January 2015. The CDC recommended that consumers do not eat any Blue Bell brand products made at the Oklahoma production facility, nor any recalled products, and that retailers and institutions not serve or sell them. Last night, Blue Bell Ice Cream announced that it was voluntarily recalling all of its products currently on the market made at all of its facilities including ice cream, frozen yogurt, sherbet and frozen snacks because they have the potential to be contaminated with Listeria monocytogenes. 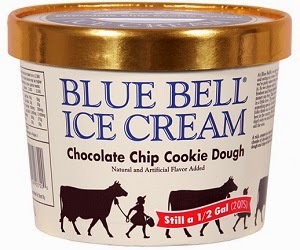 The Texas-based company said that Monday's decision was the result of findings from an enhanced sampling program initiated by Blue Bell which revealed that Chocolate Chip Cookie Dough Ice Cream half gallons produced on March 17, 2015, and March 27, 2015, contained the bacteria. This means Blue Bell has now had several positive tests for Listeria in different places and plants. Blue Bell's total recall comes after it had initially issued a limited recall in March 2015 for some frozen snack items. Blue Bell then issued another recall on April 4 after 3 oz. institutional/food service chocolate cups tested positive for Listeria at its Broken Arrow, Oklahoma plant. That recall was later expanded to include all products made on a particular production line at the Broken Arrow plant after Banana Pudding Ice Cream pints tested positive on April 7. Blue Bell is implementing a procedure called “test and hold” for all products made at all of its manufacturing facilities. This means that all products will be tested first and held for release to the market only after the tests show they are safe. The Broken Arrow facility will remain closed as Blue Bell continues to investigate. The company expects to resume distribution soon on a limited basis once it is confident in the safety of its product. Blue Bell Ice Cream's recalled products are distributed to retail outlets, including food service accounts, convenience stores and supermarkets in Alabama, Arizona, Arkansas, Colorado, Florida, Georgia, Illinois, Indiana, Kansas, Kentucky, Louisiana, Mississippi, Missouri, Nevada, New Mexico, North Carolina, Ohio, Oklahoma, South Carolina, Tennessee, Texas, Virginia, Wyoming and international locations.